Chicken and Corn Chili Verde is a dish I’ve made a dozen times and been meaning to post for a long time because it is super delicious. We make a big batch on Sunday afternoon to last the whole week served with brown rice and yoghurt. I insist you use chicken thighs, and make them free range. Chicken is generally pointless, so if I must use it then it has to be the thigh because it has more flavour, is more tender and cheaper. No arguments. 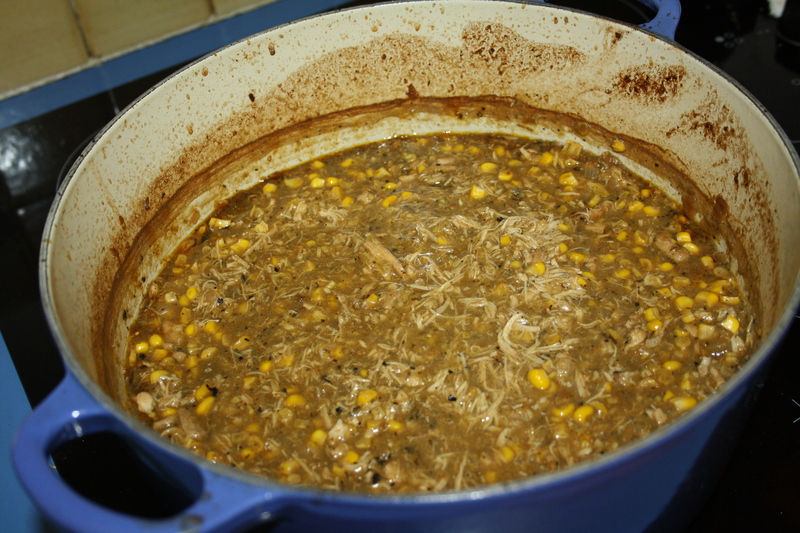 Without further ado, I present Chicken and Corn Chili Verde – she’s not much of a looker but has a great personality. You could swap the tomatillo salsa for a large can of roasted tomatillos, some roasted green peppers and jalapenos, the zest and juice of a lime and some salt and sugar – but that seems like more hassle. This would also be a perfect slow cooker recipe if I had one. Pre-heat the oven to 160˚C (320˚F), lower if fan forced. Or use a slow cooker. Into a large oven-proof pot, add each item in order to the pot frying each for the appropriate amount of time. So fry the onions and then garlic until soft and translucent, add the chicken and brown slightly, then dump everything else in. Put the pot with lid on in the oven for about 2 hours. Once the chicken easily falls apart it is done. Then get a potato masher and mash it until the chicken is all in little strands. This entry was posted in Healthy and Tasty, Main Dishes, Meat and tagged Chicken, Coriander (Cilantro), Corn, Tomatillo. Bookmark the permalink.